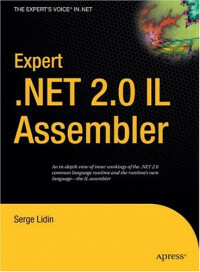 Expert .NET 2.0 IL Assember drills down into the internal structures and operations of the .NET common language runtime and teaches you how to master the IL assembly language, ILAsm. (The rule of thumb is that if the runtime can do it, ILAsm must be able to express it.) This book is ideal if you're a compiler and tool developer, a developer working on multilanguage .NET projects, or if you just want to develop tighter, faster code for .NET Framework. This comprehensive book provides a spectrum of information, from IL Assembler and Disassembler to metadata structures and exception handling. Includes detailed, hard-to-find information on the APIs exposed by the .NET 2.0 runtime. This is the only definitive guide to MSIL on .NET 2.0. We have seen tremendous consolidation in the high-technology industry in recent years. Mergers and acquisitions strengthen the product offerings of a company, but they also sometimes bring together products that, on the face of it, seem either to duplicate a solution or to present no possibility of working together.